Suki here! Have you noticed how lovely I am? 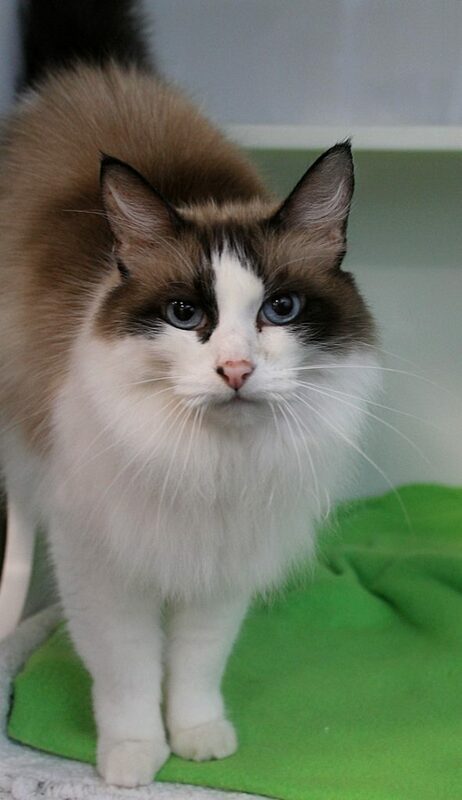 I’m a gorgeous 9-year-old Ragdoll mix with piercing blue eyes and a heart-stealing personality. I’m a very friendly girl that loves to solicit attention from new people by chirping and swishing my fluffy tail as if to say “pet me, pet me!”. Ragdolls are known for their wonderful temperaments, and I’m definitely a great example of the breed, though I may not be “pure”. When I’m feeling comfortable, I don’t mind being picked up and would probably be fine in a home with kids, especially calmer, respectful kids. I was rescued by a very nice person who really wanted to keep me, but I let her know that I don’t want to live around other kitties. I need all of the attention, after all! Even though I want to be your only feline, I’m not much of a princess; I’m pretty easy-going and mellow and will likely be a very low-maintenance girl. Since my coat is thick and a little fluffy, I could probably use a good brushing now and again, but this is something I seem to really enjoy. Pixie has done a thorough check to make sure I am healthy and at just 9 years old I know I have many more years to devote to my next family. Aren’t you smitten? I’m currently residing at Petco Unleashed on NW 23rd and Burnside, so come by to meet me in person today! I come to you fixed, vaccinated, and micro-chipped for an adoption fee of $100.